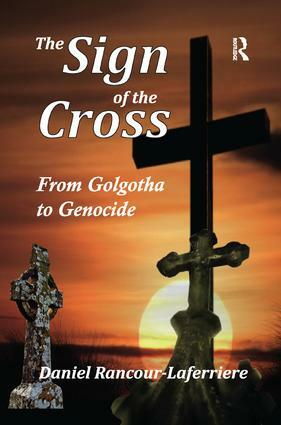 This book presents a unique effort to create a new understanding of the Christian sign of the cross. At its core, it traces the conscious and unconscious influence of this visual symbol through time. What began as the crucifixion of a Jewish troublemaker in Roman-occupied Judea in the first century eventually gave rise to a broad spectrum of readings of the instrument used to accomplish such a punishment, a cross. The author argues that Jesus was a provocative, grandiose masochist whose suffering and death initially signified redemption for believers. This idea gradually morphed into a Christian sense of freedom to persecute and wage war against non-believers, however, as can be seen in the Crusades ("wars of the cross"). Many believers even construed the murder of their savior as a crime perpetrated by "the Jews," and this paranoid notion culminated in the mass murder of European Jews under the sign of the Nazi hooked cross (Hakenkreuz). Rancour-Laferriere's book is expertly written and argued; it will be readable to a large audience because it touches on many areas of controversy, interest, and scholarship. The work is critical, but not unfair; it employs psychoanalysis, art history (the study of the symbol of the cross in works of art), religion and religious texts, and world history generally. The interweaving of these various themes is what gives this work its ability to draw in readers-and will ultimately be what keeps the reader interested through the conclusion.